The Financial Internal Rate of Return (FRR). The financial analysis should be carried out through subsequent, interlinked accounts. The first logical step in the financial analysis is the estimation of how large the total investment cost will be. The investment outlays can be planned for several initial years and some non-routine maintenance or replacement costs in more distant years. Thus we need to define a time horizon. By time horizon, we mean the maximum number of years for which forecasts are provided. Forecasts regarding the future of the project should be formulated for a period appropriate to its economically useful life and long enough to encompass its likely mid-to-long term impact. Although the investment horizon is often indefinite, in project analysis it is convenient to assume reaching a point in the future when all the assets and all the liabilities are virtually liquidated simultaneously. Conceptually, it is at that point that one can cost up the accounts and verify whether the investment was a success. This procedure entails choosing a particular time horizon. The choice of time horizon may have an extremely important effect on the results of the appraisal process. 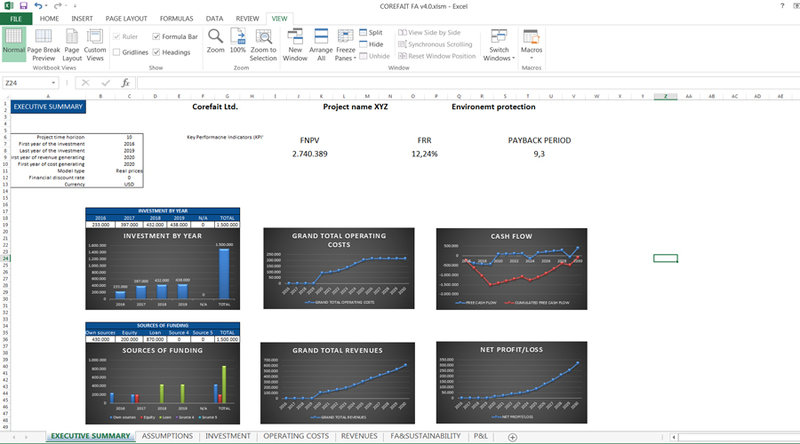 FINANCIAL ANALYSIS CAN BE VERY COMPLEX THING TO DO BUT IT IS NOT IN CASE OF COREFAIT FINANCIAL ANALYSIS MODEL. Purpose of this site and COREFAIT FINANCIAL ANALYSIS MODEL is not to elaborate on financial or any type of analysis in unimaginable details this can be done. The purpose is to give you a fully functional financial model. COREFAIT FINANCIAL ANALYSIS MODEL is created in such a manner that fully provides all the necessary information and output parameters that are required by potential investors or bank approached with the business idea and give them insight into the planned future operations. On the other hand model is so simple that it can be done by anyone without any experience in financial modeling or business planning. The only thing necessary is that whoever fills the model understands his business idea in terms of investment costs, operating and maintenance costs and revenues. 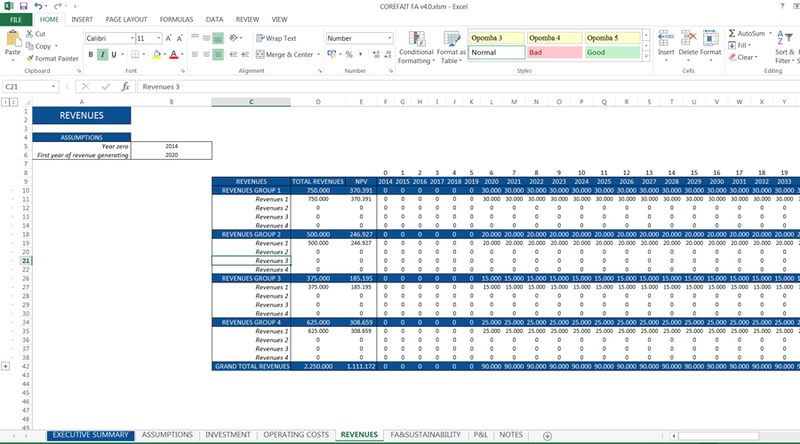 COREFAIT FINANCIAL ANALYSIS MODEL consists of 7 excel spreadsheets which are interlinked in such a manner that connects all the tables and independently calculates the output parameters based on the data entered. The first in a series of tables it is the basic model assumptions including, perhaps most importantly those related to the time horizon of the project, the discount rate used and whether model is considering constant or current prices. In addition, there are certain parts that relate to macroeconomic assumptions and assumptions specific to certain branches of the economy but at the moment they are not relevant or necessary. The second table is the one that refers to the initial investment costs of the project. This table is populated with numbers related to real investments costs needed for the project to start in years (months) when they actually occur. In addition, each investment category includes field where you can enter depreciation rate for this type of asset. 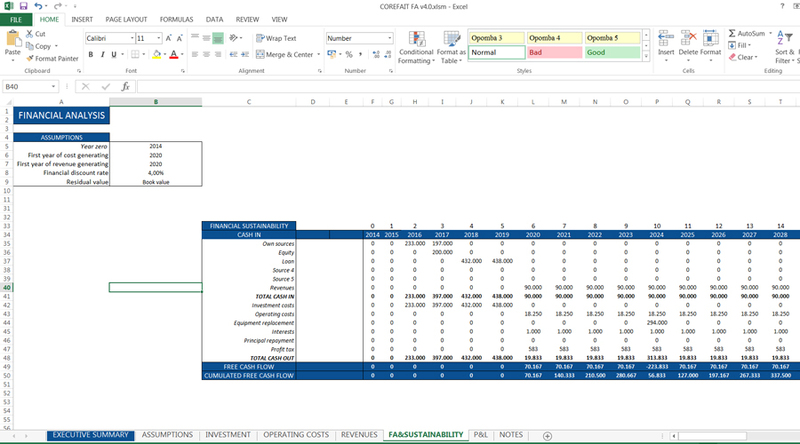 Based on this COREFAIT FINANCIAL ANALYSIS MODEL independently calculates depreciation costs that will eventually be used in the profit and loss statement. Further, periods in which it will be necessary to change fully depreciated assets will also be automatically calculated. Finally, there is a table that defines the sources of funding that will finance the investment. Investment costs and sources of funding in addition to tables are presented in the accompanying charts. 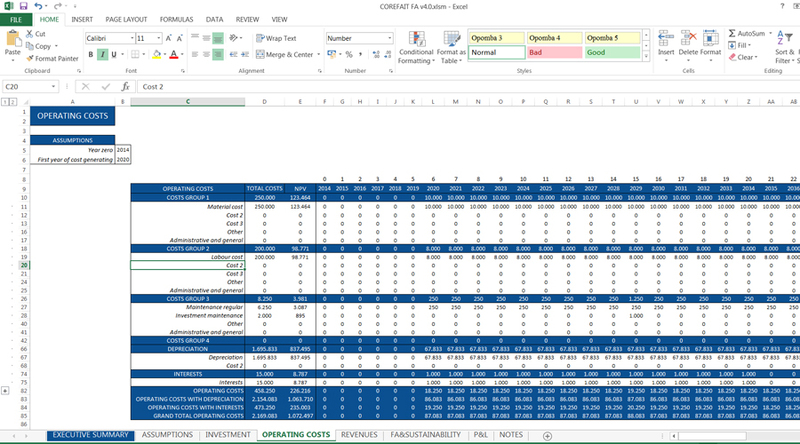 The third table of COREFAIT FINANCIAL ANALYSIS MODEL contains the operational costs that need to be fulfilled in accordance with the business model. Under the operating costs we consider direct cost of goods or services sold, employee expenses, marketing costs if any, interest costs if certain investment costs were financed through loans. These are just most common and basic costs. Operational costs table enables much more cost categories to be implemented into the model. The table with the operational costs also contains depreciation costs which are automatically transferred here from the investment cost sheet where depreciation rates are provided. In business, revenue or turnover is income that a company receives from its normal business activities, usually from the sale of goods and services to customers. 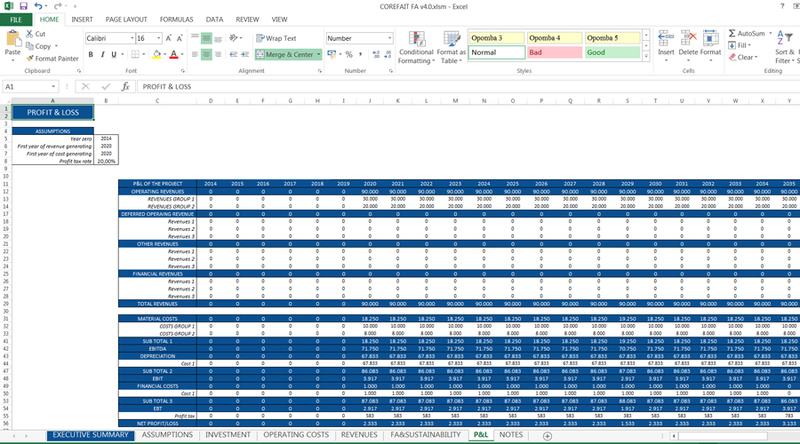 The fourth in a series of tables in COREFAIT FINANCIAL ANALYSIS MODEL relates to the revenues of the project. In this section it is envisaged to enter all the revenues from the sale of goods or services which are delivered to customers and planned by the project. FNPV shows us if the project is financially viable, FRR shows us the relation of project viability in relation to discount rate used within the project while Payback period shows us the time needed for investment cost recovery. 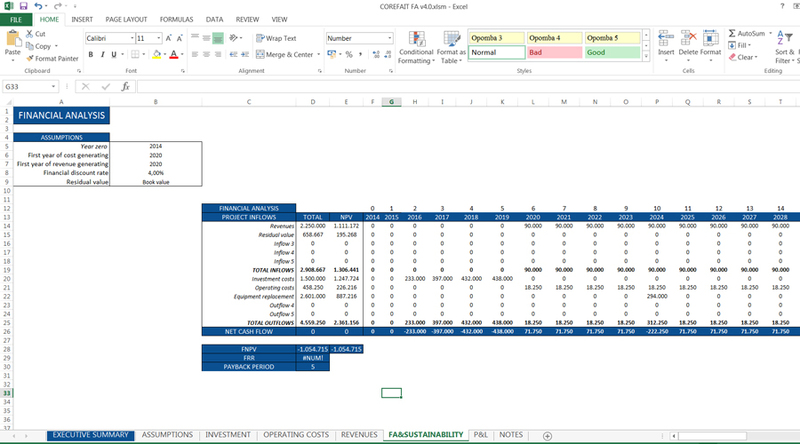 The following table which is located within the COREFAIT FINANCIAL ANALYSIS MODEL and financial analysis sheet is a table of financial sustainability. Table takes into account all the cash coming in and out from the project and on basis of that provides information on the cash flow, whether at a given moment in time available cash in the account will be sufficient for the settlement of financial obligations. Sixth table included in the COREFAIT FINANCIAL ANALYSIS MODEL is P&L statement table, in which again is not necessary to enter anything. Table alone, takes up until now entered data and on the basis of that gives outputs. Profit & Loss statement table provides information about how well or poorly the company operates in a given year. Table considers all of the operating expenses incurred in the course of one year, and all the revenues generated by the business. Based on this, model calculates the profit or loss from operations. Last but not least, seventh table of the COREFAIT FINANCIAL ANALYSIS MODEL refers to the executive summary table. Table shows the most important data both input and output which best describes the whole project. 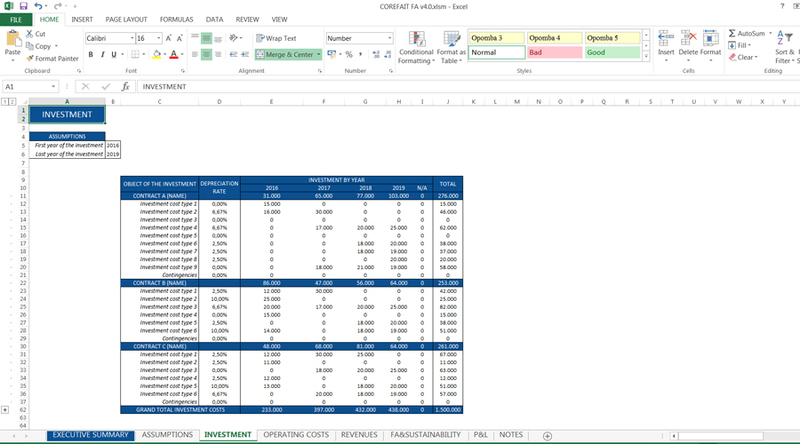 On this sheet, summarized can be found the most important data on investment costs, operating costs, projected revenues and results of operations as planned. All data are presented with the accompanying charts. 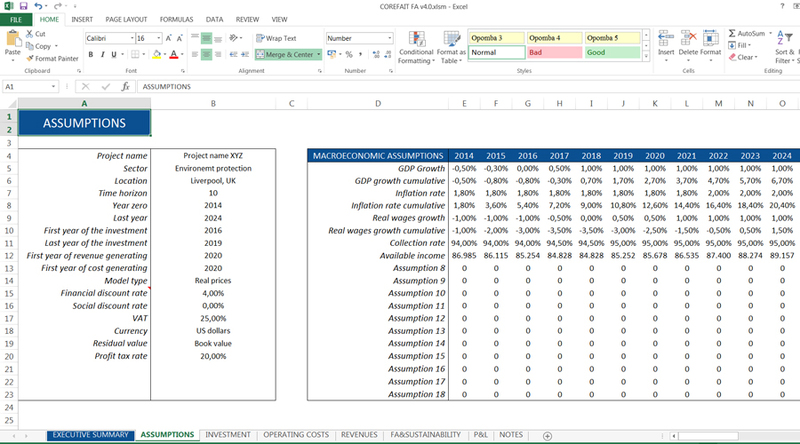 This executive summary table is best used for the presentation of the entire project without going into details that COREFAIT FINANCIAL ANALYSIS MODEL provides. Going into details can only take the valuable time to show what is most important and that is business idea that is able to create added value and profits to owners or investors to whom is presented.